Peanuts and sesame seeds are roasted and ground into paste with fresh coconut. Mixed vegetables are cooked in freshly ground peanut sesame paste. Serve mixed vegetable salan with roti or with rice. Makes: around 6 Servings of Mixed Vegetable Salan. Heat a pan on low heat, roast sesame seeds and peanuts separately. Grind sesame seeds, peanuts into powder using a grinder. Then add the coconut and half a cup of water and grind everything into smooth paste. Remove the peanut sesame paste onto a bowl and keep aside. Soak tamarind in few tablespoons of warm water for sometime and extract all the juice discarding any veins. Peel, wash and chop the potato and carrot. Break cauliflower into small florets and wash them. Whisk yogurt with a tbsp of water and keep aside. When cumin seeds change color, add green chiles. Fry briefly, add chopped onion. Fry for a minute, add ginger garlic paste. Fry till onion turns golden brown in color, add chopped potato, cauliflower, carrot, green peas, coriander powder, red chili powder and salt. Pour around 1 1/2 cups of water and cook covered till vegetables are just cooked. Stir in ground peanut sesame paste, tamarind extract, turmeric powder, yogurt and salt. Let the mixture come to a bubble and cook on low for around 5 minutes. Adjust any seasonings if necessary and garnish with cilantro. Serve mixed vegetable salan with roti or with rice. Notes: Make sure all the vegetables are cooked well. Suggestions: Adjust spice with green chiles or red chili powder. Variations: Check other mixed vegetable recipes here. Other Names: Mixed Vegetable Salan. Raw papaya is peeled and chopped and pressure cooked till soft. It is then briefly cooked with spices and finished with ground peanut powder. Serve papaya peanut curry with steamed rice and dollop of ghee. 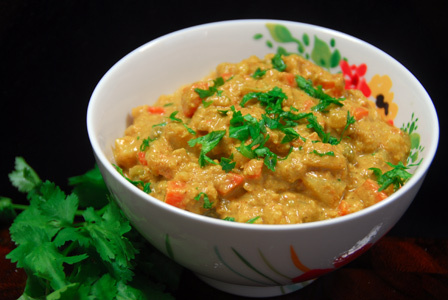 Makes: around 3 Servings of Papaya Peanut Curry. Raw Papaya 1/2 of Small One. Grind the peanuts into somewhat coarse powder using a spice grinder. Peel, wash and chop the raw papaya into small pieces (around 2 Cups). In a vessel, add chopped papaya, few splashes of water and a pinch of salt. Pressure cook the chopped papaya for 3 whistles and remove from heat. When mustard seeds start spluttering, add chopped papaya, turmeric powder, red chili powder and salt. Cook covered if necessary to make the papaya soft. Uncover, fry on medium high flame to evaporate any excess moisture. Stir in ground peanut powder and remove from heat. Serve papaya peanut curry with steamed rice and dollop of ghee. Notes: Make sure papaya is cooked well. Variations: Check other recipes with papaya here. Other Names: Papaya Peanut Curry. 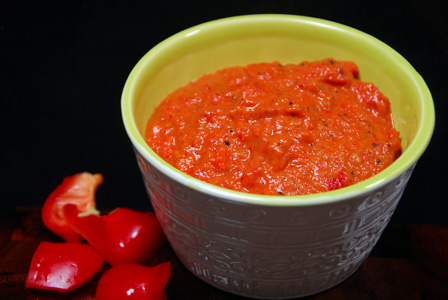 Red Bell Pepper Peanut Chutney. Wash, remove stems, discard seeds and roughly chop the red bell peppers. 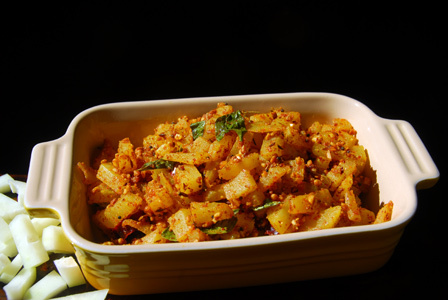 In a small pan, add urad dal and fry on low flame till it turns golden brown in color. Remove urad dal onto a bowl. Add few drops of oil in the same pan, add broken red chiles. Fry for few seconds and remove from heat. Heat oil in the same pan, add mustard seeds. Once mustard seeds start spluttering, add chopped onion and bell pepper pieces. Cook covered on low flame for around 5 – 8 minutes or until the bell pepper softens. Then uncover and fry till onion is light golden in color. Grind urad dal, red chili and peanuts into fine powder using a grinder. Then add the onion and red bell pepper and grind again into paste. Notes: Make sure to cook the red bell pepper well. Suggestions: Adjust spice with red chillies or add a green chile while cooking the bell pepper. Variations: Check bell pepper tomato chutney here. Other Names: Red Bell Pepper Peanut Chutney. Potlakaya Pallilu Nuvvulu Podi Kura. Snake gourd is peeled and chopped. Raw peanuts, sesame seeds and lentils are roasted and is ground into fine powder. Snake gourd is cooked in oil along with spices till soft and is seasoned with freshly prepared peanuts sesame seeds powder. Serve snake gourd with peanuts over plain steamed rice and dollop of ghee. Makes: around 2 Servings of Snake Gourd with Peanuts. Roast the peanuts and sesame seeds separately till golden brown in color. Grind peanuts, sesame seeds, chana dal, coriander powder, red chili powder and salt into powder. Peel, remove ends and wash the snake gourd. Discard the seeds and chop snake gourd into small pieces. 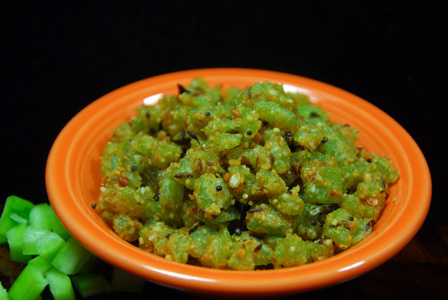 When mustard seeds start spluttering, add chopped snake gourd. Fry briefly and cook covered on low flame for around 5 minutes. When snake gourd turns soft, add ground peanuts and sesame seeds powder. Fry for a minute and remove from heat. Serve snake gourd with peanuts over steamed rice and dollop of ghee. Notes: Make sure snake gourd is cooked well. Suggestions: If snake gourd is not cooked well, cook covered on low flame till snake gourd turns soft but whole. 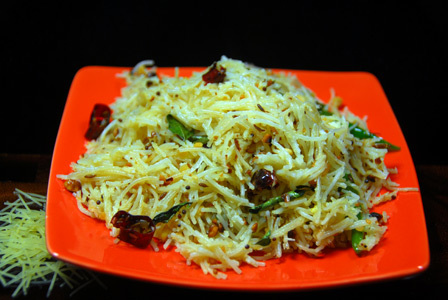 Variations: Check other snake gourd recipes here. Other Names: Snake Gourd with Peanuts, Potlakaya Pallilu Nuvvulu Podi Kura.